The Great Apes Survival Partnership (GRASP) – Ian Redmond Conservation Award was created to encourage innovation, inspire leadership, and offer hope in the field of great ape conservation in Africa and Asia. The 1st GRASP – Ian Redmond Conservation Awards winners were chosen by a five-member committee comprised of representatives from UN Environment, UNESCO, the GRASP Secretariat, and the GRASP Scientific Commission, as well as Ian Redmond himself. Four winners — two from Africa and two from Asia — each played an integral role helping ensure the survival of great apes worldwide. Click here to download the Awards magazine to read more about the 1st GRASP-Ian Redmond Conservation Awards and the winners. 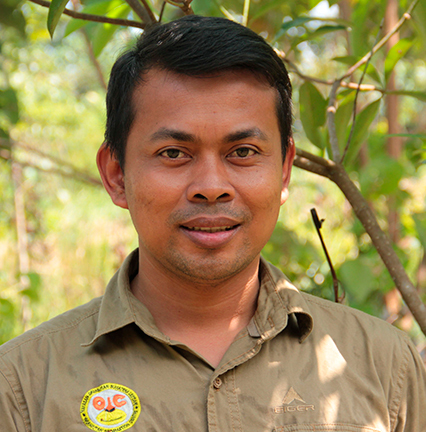 Panut Hadisiswoyo (Indonesia) is the founder of the Orangutan Information Centre (OIC) and runs its Human-Orangutan Conflict Response Unit (HOCRU). The HOCRU team responds to reports of human-orangutan conflict, as well as to reports of illegally held captive orangutans. It also conducts regular field monitoring of translocated orangutans, and identifies orangutans who have been isolated due to human encroachment or agricultural expansion and therefore require relocation. In 2014, with the help of GRASP – Ian Redmond Conservation Award funding, HOCRU evacuated 17 orangutans living in isolated forest patches. It also developed a Disease Risk Assessment process that will soon become part of a broader standard operating protocol in all translocations. Twenty evacuated orangutans were also released into primary forest adjacent to a restoration site, and an additional primary release site is under consideration so as not to overpopulate any one region. HOCRU interviewed communities extensively, trying to determine whether individuals were aware orangutans protected status under Indonesian law. Over 700 community members in this project period were involved in HOCRU’s education and outreach activities. More than 1,000 brochures and 1,000 posters were printed and distributed as well. The HOCRU programme has been acknowledge by key stakeholders in northern Sumatra as the only team addressing human-orangutan conflict problems, and they have therefore developed crucial relationships with local governments and communities living in and around this region, the last stronghold of the Sumatran orangutan. Arrey Emmanuel Enow’s team at the Last Great Ape Organization (LAGA) in Cameroon takes on conservation from a different angle, targeting corruption and legal enforcement to ensure that the laws in place to protect great apes are being upheld. LAGA’s innovative approach makes it is the first project in Africa to work with the government to improve wildlife law enforcement at the national level. With the help of the GRASP – Ian Redmond Conservation Award prize, Arrey and his LAGA team carried out 350 investigations that resulted in the arrest of 58 wildlife traffickers. In addition, 50 cases were overseen within the legal system. This project also resulted in the seizure of 80 chimpanzee and gorilla skulls, an alarming surge of trade that merits closer scrutiny. 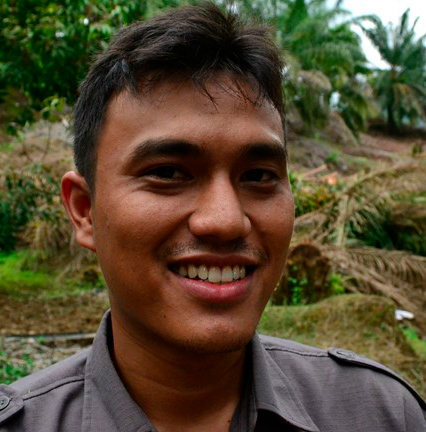 Tezar Pahlevie (Indonesia) works to protect and restore rainforest habitat in the Sumatran province of Aceh. This region is home to critically endangered Sumatran orangutans, in addition to sun bears, sambar deer and elephants, yet faces increasing pressure from agricultural development and human encroachment. Aceh, like many parts of Indonesia, is plagued by the rapid expansion of illegal oil palm plantations, many of which overlap prime orangutan habitat. Tezar’s team estimated that at least 4,000 hectares need to be reclaimed from illegal palm oil plantations and restored, and the GRASP – Ian Redmond COnservation Award facilitated a pilot project to restore some of these hectares and the reestablishment of Aceh wildlife’s coalition of support. In September 2014, after dialogue with Tezar’s team, the District Head agreed to remove the illegal oil palm that had been planted inside the protected Leuser Ecosystem, within Aceh. Tezar was able to bring together all the relevant stakeholders to form a coalition to stand together and push for the restoration of these damaged forest blocks. 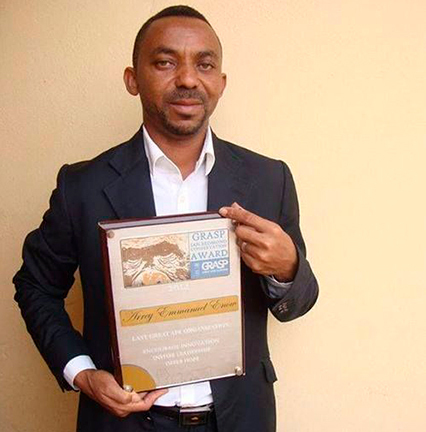 The world’s rarest great ape — the critically endangered Cross River gorilla — benefits from the inspired work of GRASP – Ian Redmond Conservation Award winners Inaoyom Imong in Nigeria. 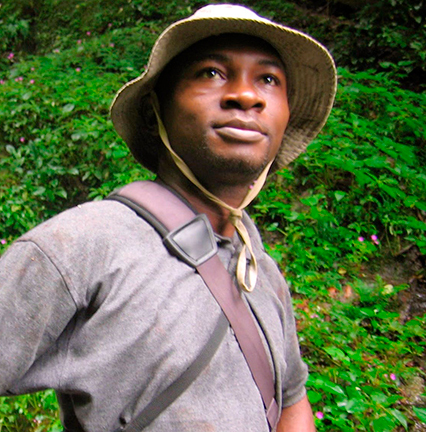 Inaoyom’s work focuses on the Mbe mountains, a critical movement corridor for gorillas and chimpanzees, and part of a community wildlife sanctuary that is managed by nine different groups who live in the area. Inaoyom helped support community eco-guards by providing CyberTracker devices for data collection, along with intensive training. Daily anti-poaching and gorilla monitoring patrols were carried out and generated data that provided distribution maps for ape evidence and human activities that the communities could discuss at meetings and act upon. Inaoyom and his team recorded 31 gorilla nest sites, 16 chimpanzee nest sites, 643 wire snares, and 49 expended cartridges, and additional data will aid the communities monitoring the Mbe Mountains in protecting it from poachers, targeting areas with high volumes of evidence of human activities.